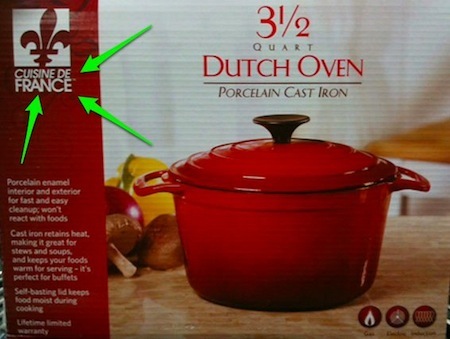 I was walking around BJ’s the other night and saw an enameled cast iron “french” pot and I joked to my husband that it was probably a french pot, made in China. I half-heartedly turned over the box, and I admit I was a tad bit surprised to see “made in China”, well not THAT surprised, but it did shock me a little. It still amazes me that companies are allowed to push the limits of fair & truthful marketing with their sneaky packaging and labels! I suppose it’s too much to ask that something named “Cuisine de France” (which according to the manufacturers’ web site means “French Kitchen”) would actually have something to do with France except for the name on the box! I know, I know, everything nowadays is “made in China”, but if you know about good cookware, you’d know there are still cast iron pots being manufactured in France (Le Creuset and Staub); in fact, one of the kitchen tools so many home cooks aspire to own, is a good-quality french enameled cast iron pot! 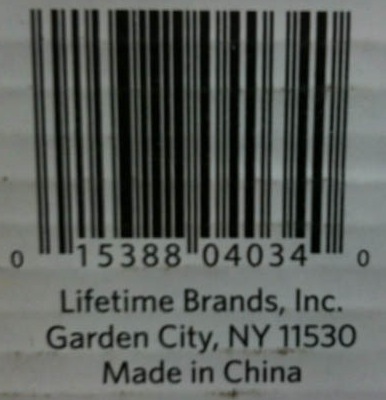 I really think Lifetime Brands took advantage of that fact by making it look like this could have been a french-made pot, when in fact it’s no better than any other cheap no-name import. At first glance, I admit I fell for it, and I bet a lot of other consumers did too. Author debbie @ That's Just MePosted on May 28, 2012 Categories Kitchen Tools & Equipment, ReviewsTags cheap knock off, cookware, Cuisine de France, enameled cast iron, Le Creuset, Lifetime Brands, scam, staub2 Comments on French Pot? Try Again! 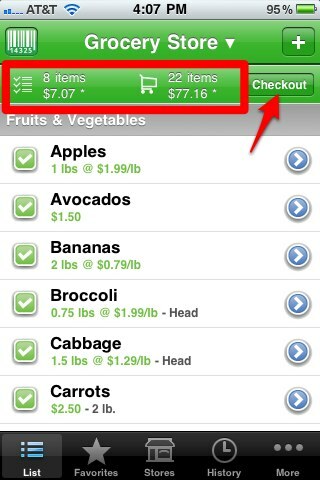 I have been using the Grocery IQ app on my iPhone for years. I started using it way back when I had my iPod Touch; I believe I even paid $1.99 for it back then (and worth every penny), but it’s FREE now! They do add a bit of “advertising” but after awhile, it’s not even noticeable. This app is indispensable for grocery shopping, keeping me organized and within my food budget! When I first began using Grocery IQ, I only wanted to keep track of my shopping lists, and it works great if that’s all you want to do. But it offers more features for the serious shopper! It’s easy to add an item to the shopping list either manually or with the handy built-in bar code scanner; the items are organized by aisles. You can customize your “aisles” – arranging the order & renaming or adding new aisles. It keeps track of multiple stores, and a separate “favorites” and “history” for each store. I have always loved and used this app, but recently, I became more serious about sticking to a food budget, so I started adding item prices and quantities/weights. At a glance, I can see I can see the total cost of food in my virtual shopping cart, as well as the total of how much is left on the list. I know exactly how much I’m spending and it’s a whole heck of a lot easier to use than a calculator! Below, there is a screenshot of my last shopping trip – There is $77.16 of food in my shopping cart, and there’s $7.07 still left on my list. I decided to leave the rest of the items on the list until the next shopping trip. Grocery IQ is available for iPhone, iPod, iPad, and Android users, as well as syncing to their web interface too. It’s free, so how can you lose!? Williams Sonoma Outlet – 60% Off All Staub Cast Iron Cookware! I found out about the HUGE Staub 60% off sale down at the Williams Sonoma outlet store in Wrentham, MA! I debated if I should make the hour long drive down, but I’m so glad I did! I phoned them first to see if they had any large ovals, and they didn’t, but they did have 6.25 quart round. I decided that the discount was worth the gasoline and time, so I made the trip! When I arrived, I didn’t realize how large the Wrentham Outlet mall was. Wow! I didn’t really know where to park, so I took a chance and parked by the Banana Republic store. I started walking toward the right and found a directory, and realized that the Williams Sonoma store was at the LEFT end of the mall in the back, toward where I originally parked. That’s good! I wouldn’t have to lug my heavy purchase too far, so I turned back and walked the other way toward the store. On the directory, I also noticed that the Le Creuset outlet store was very closeby as well, so I took a peek on my way to WS. They were having a 25% discount sale, nothing to match the 60% off, but it was fun to look anyway. I was shocked to see the huge 15 quart pot on display. Wow, I didn’t know they made ’em that huge! Anyway, back to my Staub purchase. I had a difficult time deciding what to purchase. Yes, my ultimate dream would have been a large oval pot, and I was debating the 6.25 qt round vs the 4 qt oval chicken roaster (matte black). This roaster is not the same as the Coq Au Vin oven, which would have made an even tougher choice. This pan is shaped like a chicken, with an awkward shaped lid. And since I already have a 4 quart round pot, in the end I decided the 6.25 qt would really be the best. They also had many gratin pans in many sizes. I decided the medium sized 11 inch should fit nicely in my small counter-top oven for roasting a small chicken or a chicken breast, plus I’d be able to sear on the stove first! I debated the 13 inch covered gratin, but thought it might be too large. So for a total of $138 (including tax) I bought my dream 6 qt round and the 11 inch gratin. Now I can give away my old “made in China” 6 quart pot! I love Staub! I actually prefer it to Le Creuset! ha! I love the black enameled interior, it’s so easy to clean, and it’s a workhorse! I take care not to use metal utensils in my enameled cast iron. I mostly use wooden. So, I think my collection is complete! I think the only other pieces I would consider would be a larger fry pan (not grill pan) but then again, plain ole cast iron would probably be the best for that piece. And maybe possibly an oval piece, but then again, why? I think I have all the bases covered with the sizes I have. I’m thrilled! Oh and the sale is until the end of the month, and there were still lots to choose from, many gratin pans, minis, 3 qt ovals, and a few 4 qt oval pots, along with two more 6 quart rounds. They had a bunch of the black chicken roasters too. They also have these cool-looking tall sauce pans, but I think they are more for cool looks, than actually serving a cooking purpose. And such beautiful colors, too. I love the basil green and the deep blue is stunning. The graphite gray is nice, and the matte black too. My pieces were in the Williams Sonoma exclusive red. It’s a darker red, almost burnt color. Wasn’t my first choice, but for this price, I will NOT complain! EDIT 2011-07-29: Still haven’t unpacked the BIG pot, but I baked a meatloaf in the 11 inch gratin pan. Very nice pan. I think I’m going to use it a lot! Author debbie @ That's Just MePosted on July 28, 2011 July 29, 2011 Categories Kitchen Tools & EquipmentTags 7 qt cocotte, cast iron, cookware, enameled cast iron, kitchen equipment, kitchen tools, sale, shopping, staub, Williams SonomaLeave a comment on Williams Sonoma Outlet – 60% Off All Staub Cast Iron Cookware! I bought my Le Creuset stoneware 9inch square baking dish for a bargain price at Home Goods and it is my favorite baking dish. I have been using it for at least a year or two, and I think my favorite use is roasting vegetables – it cleans up very easily too. I’ve also baked egg frittatas in it, along with desserts. Sometimes, baked on eggs do require a bit more elbow grease to clean it, but probably my fault for not pre-coating with enough oil. Scratches or black marks from metal utensils (which I try not to use very often in the dish) are easily removed by using a touch of Barkeepers Friend cleanser. The Le Creuset stoneware pieces are strong and very well made. No, I don’t recommend paying full retail price for them, but if you run across one or two pieces of Le Creuset stoneware at Marshalls, Home Goods, TJ Maxx, Tuesday Morning, or other discounters, then grab it! I believe I paid about $15 for the 9inch square piece. I was tempted at a later date to purchase the large loaf pan, but decided to wait. Last summer I did this, and it worked so well. Today, I moved my smaller counter-top oven outside to our enclosed porch. This way I can still cook in the oven and the house won’t get too steamed up! Author debbie @ That's Just MePosted on June 8, 2011 Categories Kitchen Tools & EquipmentTags convection oven, cooking, counter top oven, summerLeave a comment on Moved the Oven Outside! I received the set of four Preserve Dry Measuring Cups for Christmas. I wanted to replace the older plastic sets with something definitely BPA free, and Made in the USA. I found it in the Preserve measuring cups! Each piece is made of sturdy plastic, but very well made, with smooth edges. Larger cup size than my older sets, and more accurate. I didn’t realize how inaccurate my old ones were until I poured 1 cup of water from my glass liquid measuring cup into the 1 cup from Preserve, and it was right-on! You could probably use these to measure liquid as well as dry if you’re in a pinch. Love the bright green color. The cups snap (attach) together at the handles so they will stay together if that’s what you want. Personally, I didn’t like keeping them attached because it took too much time (and two hands) to detach. Don’t stack straight on counter. I like keeping them stacked together on my counter, and they don’t sit flat. Difficult to read text on handle. Each measurement descriptive text is engraved (impressed) on the handle, but it blends in, sometimes making it very difficult to decipher which cup is which. Bottom line, I love them, and I recommend them, especially if you are trying to find products made in the US. I don’t like using plastic very often, but since these measuring cups will not be heated, I figure I’m fairly safe. Plus, they are BPA free and I feel they’re safer than anything made in China, including stainless dry measuring cups. Well tomorrow is a full 24 hour day of cooking on QVC and I am so excited! Looking forward to learning about the Vitamix blender, along with seeing all the new toys. The joy starts at midnight tonight! Whoo hoo! Would you believe that while I am a Q Junkie, I’ve never purchased one thing from them! Ha! I’ll update this post as the day goes on! UPDATE: 9am Sunday, Stayed up as long as I could last night to watch the Vitamix presentation, but fell asleep in bed at around 12:30am. Woke up this morning at 7:30 to watch Caroline’s show. They presented a set of two microplanes and they look pretty cool. Checked them out on amazon, and I added it to my (Amazon) shopping cart. I might buy one for zesting and cheese. We’ll see. UPDATE: 12pm Sunday, it’s time for In the Kitchen With David – 4 hrs! whoo hoo! Watched most of the morning shows. I find it a bit disturbing that the best selling cookbook on QVC is the Eat What You Love: More than 300 Incredible Recipes Low in Sugar, Fat, and Calories book by Marlene Koch. The artificial sweetener craze is bigger than ever, and it really makes me sad. Oh well, that is a subject for another day. I did request the book from the library. Going to give it the benefit of the doubt before I condemn it! Vitamix buzz on the QVC kitchen discussion forum is that the model offered on the Q is slightly different…and the 5 year warranty is less than the 7 year if purchased directly from Vitamix.com. A lot of people are buying them though. It’s fascinating to watch the presentations, but truthfully I don’t think I need something that elaborate. I have a blender and a food processor already, and I’m not so much into smoothies. Well I did it, I ordered a new bread machine! My older Breadman bread maker seemed to be on its last legs. I know I’ve been saying that for months, but it just keeps on going! My husband has tinkered with it several times bringing it back to life when I thought it was a goner. Unfortunately, I’m afraid the poor thing won’t last much longer! It’s served me very well throughout these months on my bread journey. I’ve learned so much and I’m still growing and learning. Bread is amazing! But I think it’s time to move on. After a lot of thought, I decided to go with the West Bend 41300 Hi-Rise Electronic Dual-Blade Breadmaker. I just placed the order through Walmart.com and it’s estimated to arrive at a local Walmart store in a couple of weeks. Then I’ll have 90 days to test it out, put it through its paces and decide if it’s the right model for me. Yikes, this is not the week for kitchen electronics. Don’t things happen in threes? Uh oh, what else can go wrong? First my bread machine bit the dust (thankfully, DH fixed that, albeit temporary) and now my beloved Hamilton Beach counter top convection oven is dead. DH can’t revive it! I used it this morning for baking bulgar wheat cereal, and then I turned it on to preheat for the apricot nut bread this afternoon. I went to bake the bread, and when I opened the oven, it was not hot. It was just barely warm, so I know it did initially start up. I have used this oven non-stop since December 2006, when I received it as a Christmas present from DH. That’s 3.5 years of hard labor! Yeah, it would have been nice if it lasted longer, but it was under $100! What do you expect!? Ha! So, I am definitely going to grab a new counter top oven. Don’t know if it’ll be the Hamilton Beach, but it’s definitely a contender. I will miss you, oven! But I’ll get a new one to replace you soon! Author debbie @ That's Just MePosted on July 26, 2010 July 27, 2010 Categories Kitchen Tools & EquipmentTags convection oven, counter top oven, Hamilton BeachLeave a comment on My Oven Died! Well I wrote about this previously, how my Breadman bread machine just stops working when I’m loaded up and ready to make dough. I’ve now learned to check if it’s working first before I add my ingredients to the bucket. Mike has tried fixing it several times. He has to manually turn the paddles or lever so the motor turns. It must be ceased up, and he has to release it. I don’t know how long it can keep being fixed like that, so the time has come to just buy a new machine! So, which model to purchase and how much to spend?